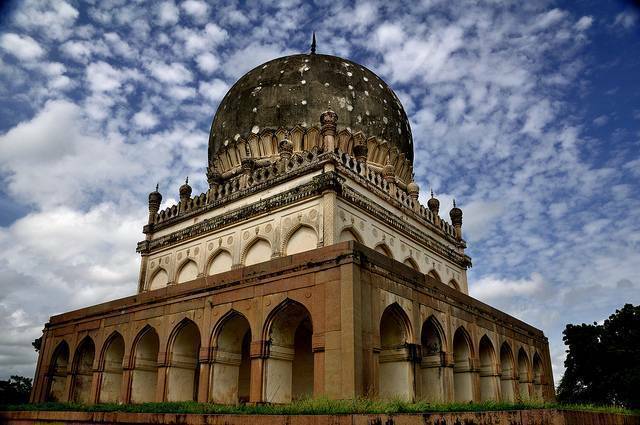 The Ibrahim Bagh nearby the famous Golconda Fort houses the tombs of seven Qutab Shahi Kings. Smaller Tombs has single storeyed galleries whereas the Larger Tombs has doubled storeyed Galleries. The center of tomb has the casket over the burial vault underneath. The domes were decorated with blue and green tiles initially but now only remnants can be seen. The architecture is the blend of Persian, Pashtun and Hindu Form. As per historical facts, the tombs were equipped with carpets, chandeliers, velvet canopies etc On the tombs of Sultan Golden Spires were fitted to distinguish it from rest of the royal family.